Some pulp and other magazine covers to celebrate the 4th of July. Happy Independence Day to our American readers. 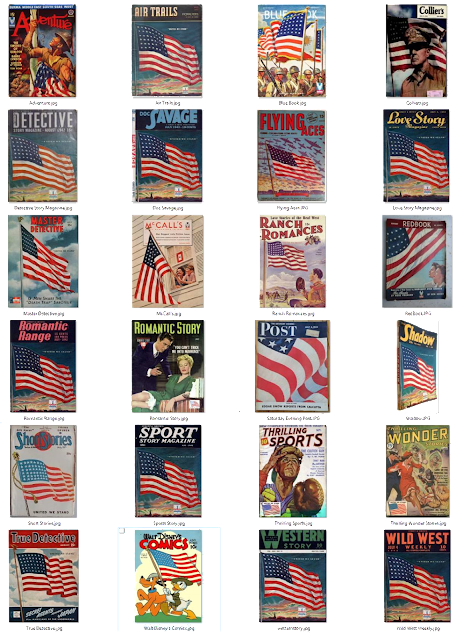 These magazine covers featuring the American flag are from World War 2, in July 1942. Seven months after the attack on Pearl Harbor, morale was low, war bond sales (funding the war effort) were low, and the fear of rationing paper was high. Publishers and the US government got together in an effort to boost morale and increase war bond sales, indirectly proving the value of magazines in keeping morale high. More about that in this wonderful website from the Smithsonian institute here. The Adventure cover is missing from their list, though. Street and Smith had the same cover for all their magazines. The covers that stand out for me are Flying Aces, Short Stories, RedBook and McCall's. It must have been great to see all these covers on a newsstand. What are your favorite pulp covers showing the American flag?